In a bowl, add the butter, Creole spices, lemon zest and juice, salt and pepper and mix to combine. Stir in the chopped chives and set aside. The butter can be made ahead and chilled; bring to room temperature before using.Preheat oven to 350 degrees F.Preheat a large well-seasoned cast iron skillet or nonstick skillet over medium-high heat. Line the bottom of a 9 by 11-inch baking dish with the lemon slices and dollop half of the compound butter evenly over the lemon.Evenly coat both sides of each fish fillet with 1 tablespoon Creole seasoning. Working in batches if necessary, add the seasoned fillets to the hot skillet, and cook 2 minutes on each side to just toast and brown the seasoning. 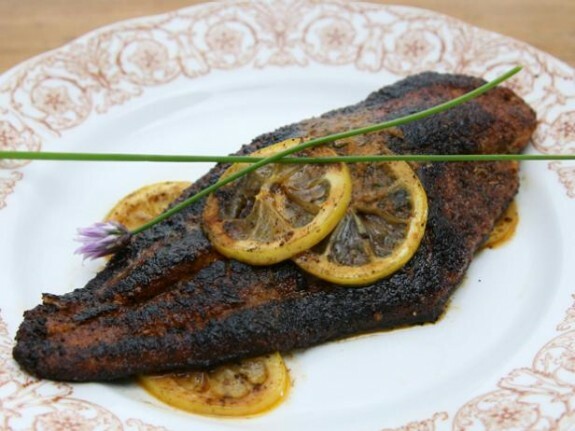 With a spatula, carefully place the seared fish on top of the buttered lemon slices in the baking dish. Bake until fish easily breaks apart with a fork, 12 to 15 minutes. Immediately top each hot fillet with a spoonful of compound butter; transfer to heated serving plates and garnish with a few whole fresh chives crossed like an x over each fillet.